I had to cram in a lot of sewing just before Christmas because of that power outage. 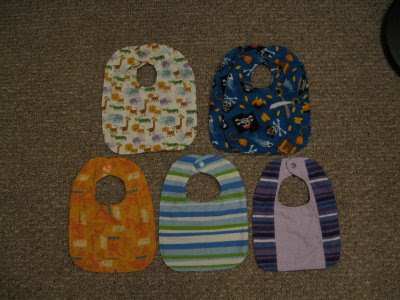 The bibs were pretty much the same as the other ones, but different fabrics. 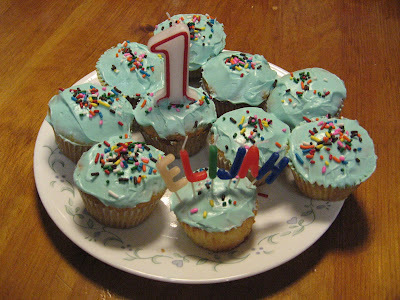 Four were for my nephew, one for Elijah, one for an order and that purple one snuck in a picture again. I like the green stripe with the animal prints. 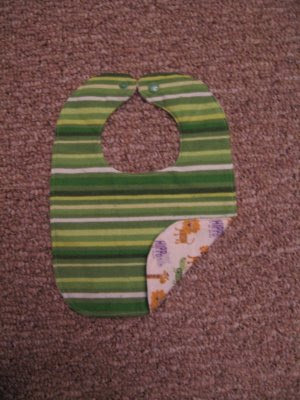 I made one reversible, and one just animal prints to have a matching green one later. 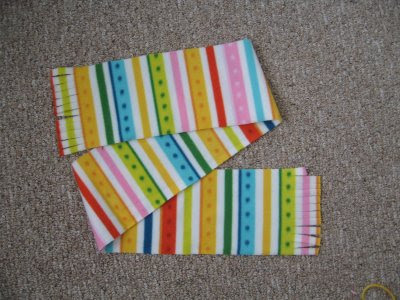 I was really satisfied with the look of this scarf for Eve. WAY CUTE! I used a rotary cutter, and it made it so fast to make. In retrospect, I should have made some more to give away for Christmas. I love this little diaper. 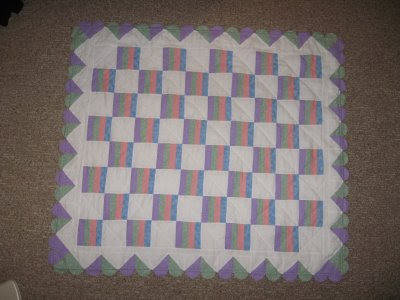 It was still time consuming for a normal projects, but fast for a diaper... and so, so cute. 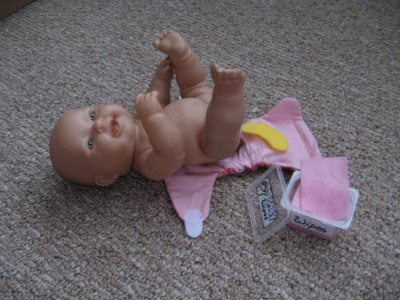 The are lots of nice features not found in other doll diapers I've seen. It has double sided aplex tabs, so you can roll it up, elastic in the legs, some pretend doo-doo and pee-pee, and there is a 2 layer fleece "soaker" inside, giving it a little thickness. Definatly cute. I also made a container of fleece wipes to go with it. If I sell these, I'll make a printable label so it will be quicker. The top quilt is the one I made for Elijah, and the bottom is one that my mother-in-law had commissioned for Eve. The cupcakes make me hungry every time I look at them. Time: Been in the works for over 10 months. Cost: Who knows, it should have been more... next time, I buy extra fabric! So I was chugging along decently with this quilt, until I got to the heart border and realized I didn't have enough fabric to do it all. No prob, just go buy more, right? Well Ben Franklin's Crafts doesn't really have stocked selections... you get what you get (or don't get enough of!) So skip ahead 7 months and I realized the night before his party that I was planning on giving it to him for his birthday. Luckily, I was able to salvage enough fabric (barely) for the frill, and I just skipped the hearts. Of course I messed up cutting the backing and had to piece that together too, which too an added hour to figure out how to get enough fabric and still make it look nice. I think it turned out okay, but I'm glad to have that over. I like that it looks more boyish without the hearts, but I really wish it was bigger. 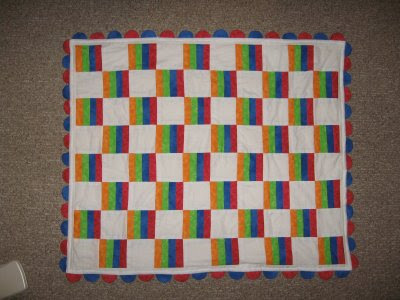 I used 80/20 cotton batting and I still have to do the actually quilting, which I was going to do by hand, so we'll see how that goes. Cost: The cost of the food in our fridge minus savings on electricity. These are pictures from the ice storm that his New Hampshire pretty hard. That ice was really satisfying to crunch! We lost our power just before my parents drove up from Louisiana to stay with us... So I wasn't able to vacuum the house (Eve had gotten playdough all over and cheerios were smashed into the carpet from while I made those 3 orange diapers) or do any almost any of the cleaning/fixing up I wanted to do. Plus, I was planning on doing my Christmas sewing that weekend. And we lost a lot of our food. But I did have a lot to be thankful for. We had heat from our landlords generator, and our stove was gas. We had food to eat and it was kept cold on the deck (until the last 6 hours of the outage, in which it hit 59 degrees- of course). We had disposable diapers on hand because of Eli's rash, our laundry was done and the cloth diapers had made it into the wash. Even most of our dishes were done (when does that ever happen?). We could charge our laptop/toothbrush/DS at Jon's school, and later we were able to hang out at a friends house who got power, and little later, internet. And most fortunately, the power came back on two hours before my parents got there!!! I vacuumed and cleaned (and put back the surviving food in the fridge) like a madwomen. Still, it messed up their visit a bit. I was going to look up events to go to while they were here... I was going to get the sewing done, and I was going to have food they could eat on hand (rice/soy based foods for my mom and vegitarian foods fo my sister). So, besides the fact that they were bored, neglected and hungry, the visit went fine :) Oh well, at least now (Jan 1st) I'm starting to get caught up with everything. Pattern: It's a mix of the different styles of pockets diapers I own already. I think I found a keeper! 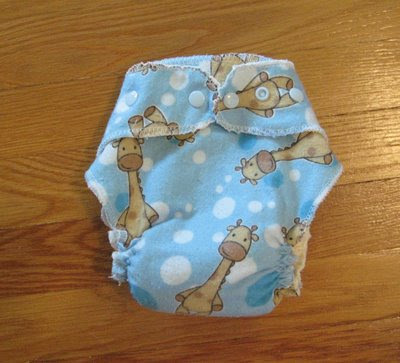 I've been working on modifying my diaper patterns for a while, and I finally found one I really like. The 'sky' blue diaper I made with my first pattern, and I didn't really like it much. The upper snaps were too close together at the top, not close enough to the top of the diaper and made Eve complain that they hurt. 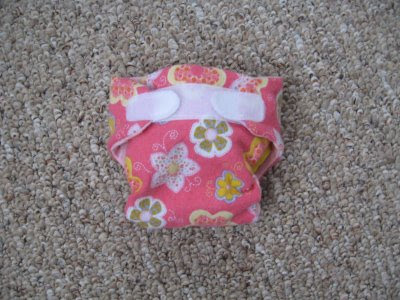 Plus the OS rise snaps made the diaper too small, as did the tightness of the elastic I used. I changed the snaps placement for the next pattern, added in a middle OS column, and made the whole thing longer and the tabs wider. The pictures show the three rise setting. The smallest orange diaper and the blue one are on the same settings. You can see how the orange one is much bigger with all the changes I made. Elijah's (11 months) snap settings are on middle orange one and Eve's (3 years) is on the largest. All of them are shown stuffed with one insert. The three orange ones were made in (almost) one night with the new pattern. I used swimsuit elastic, melon PUL and buttersuede (I can't wait until I get my CuddleDry Microfleece in). The orange snaps are from Serena's notion supply. It's one of her custom colors and match much better than the store-bought melon diaper's snaps I have here. I really liked using white snaps at the top and colored snaps on the body. It's less confusing to 'newbies', it makes it harder to see the OS snaps (which I never really liked the look of) and I really like how the contrast of white brings out the bright colors. I made this diaper because Elijah was having terrible diaper rash. His skin was peeling and he was in a lot of discomfort. I was trying to let him go without covers, but I mostly have pocket diapers. 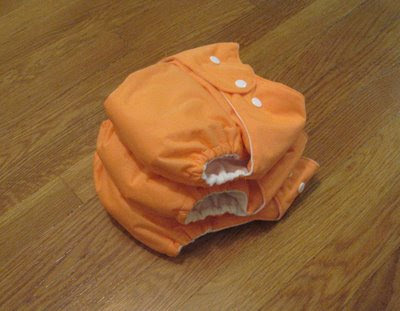 I only had two other fitted diapers and I was sick of pinning pre-folds on him, so I made this one to add to my stash. The diaper itself is cute, but sloppy. My serging was terrible, and I don't think I used enough leg elastic. It has blue flannel outside, and tan inside, with 2 layers of Zorb for a soaker. Unfortunately, it didn't help get rid of the rash. It was turned out to be a different kind of rash, caused by the cloth diapers only. Disposables have cleared it up fine. It's been a month and I still haven't gotten him back into the cloth, which worked perfectly because we would have had to put him in disposables soon anyway: We had a 3.5 day power outage, followed by a week of family visits, Elijah's birthday, and traveling to my grandparents for Christmas week, followed by Eve's birthday. (If you can't tell- I backwards date these posts, so I have a record of when I actually made the items) Anyway, I really need to troubleshoot the problems soon, so I can get him back in cloth. Suggestions welcome!